Tuesday I experienced what it is like to be a commuter to London. 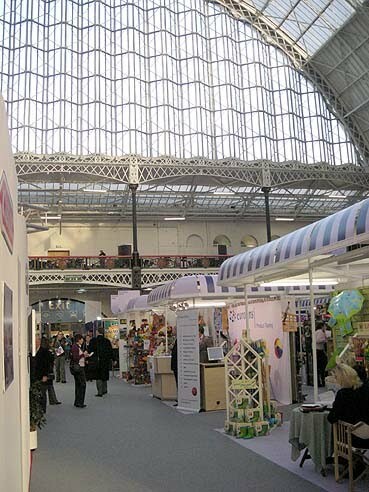 It was my day at the London Toy Fair trade show. Paul dropped me off at the Maidenhead train station on his way to work, and I got the 8:34 into Paddington Station. It was packed with people as this is rush hour for the workday. I was on an express train which should only have taken 22 minutes, but instead it took about 45 minutes. For some reason it stood around awhile about halfway there. Train and Tube delays are pretty normal, based on the traffic reports I hear on the radio in the morning. Just like any big city in the world, I guess!! In Paddington it was simple to walk right down to the Tube. I was heading to West Kensington, which was only about 2 1/2 miles from Paddington. In the summer I would have walked it just for the sights I’d pass. But now I only had 45 minutes to get to the show and it was a cold winter morning, so the Tube is the thing. It took me about a half hour with one train change. 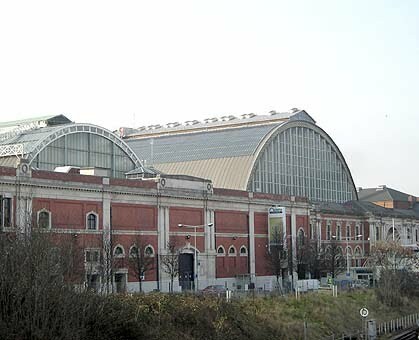 The Toy Fair is held in a large Victorian exhibit hall called the Olympia. The Tube stop is right in front of the main entrance, which was very handy! The Olympia has two beautiful arched glass roofs, and inside you can see the vintage ironwork holding it up. 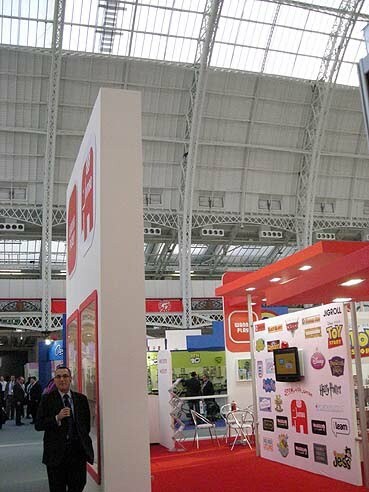 But today the floor was all 2010: big trade show booths from all kinds of toy brands and distributors. If you want to know what will be on the toy shop shelves next Christmas, this is the place. Everyone I talked to does the circuit this time of year. They just came from Hong Kong, and after London were headed to Nuremburg, Germany for the Europe version. 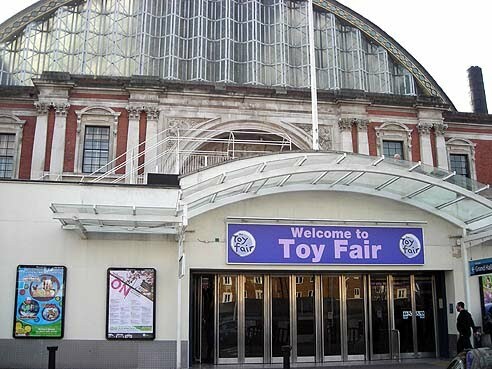 The Toy Fair in New York is the granddaddy of them all, and it is coming up in February. Whew! You’d think it would be really cool to be here, and it was, but it was also incredibly frustrating because you can’t BUY anything. It is all there for display only to industry buyers. So you can look but you can not have! 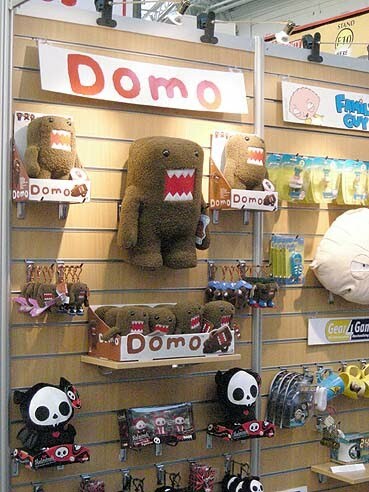 This display caught my eye, I keep meaning to buy one of these Domo guys after I bought a massive one for my Nephew a few Christmases ago. I love them!! 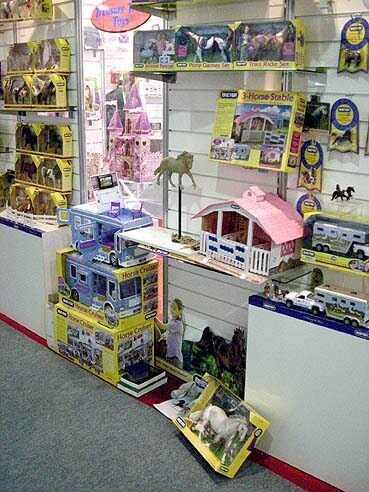 Here is the Breyer display by Treasure Trove Toys, my host for the day. 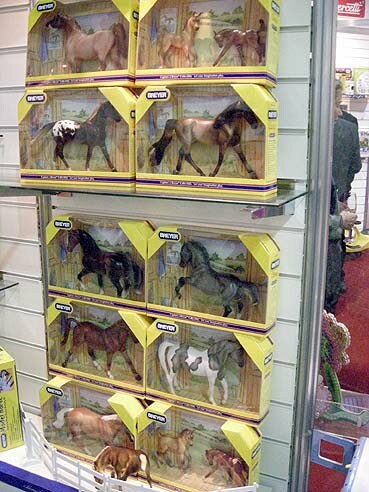 They carry several different toy lines, but Breyer and Brio are their largest. 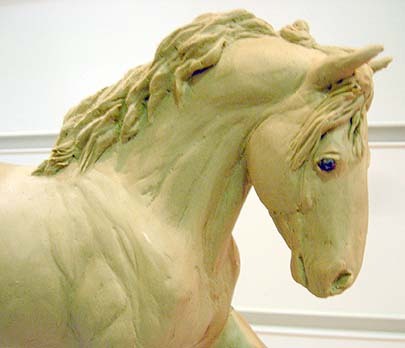 I stood in front of this Wall ‘o Breyer all day, and just spread the gospel of the plastic pony! A few days earlier they picked up my “Roundabout” sculpture from my house and it was waiting for me there. (Way too difficult to bring that on the trains!) It was placed on a shelf in the middle of their Breyer wall, and I “worked” on it all day. This day was specifically called Press Day, for the local press or anyone with journalist credentials to get in, to publicize the event. 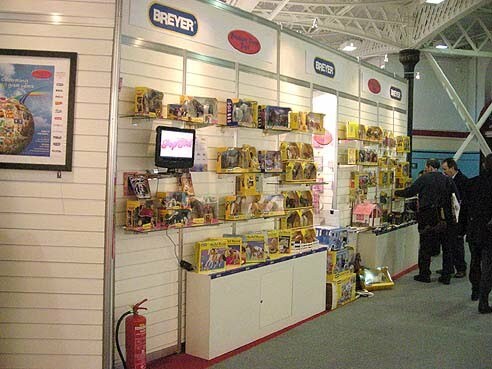 At Treasure Trove, they had invited several inventors of their other toy lines to attend. 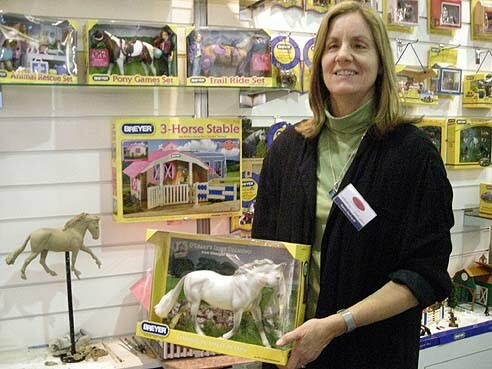 I was the “inventor stand-in” for Breyer. Roundabout didn’t have a mane or tail before the day started, but that was the simplest thing to “tweak” at an event like this, where I wasn’t going to do any serious sculpting work (especially since it was too low and fairly hard to get at). So he grew a mane and tail and it changed all day long. Plus he got a roughed-in eye, bit of nostril, and mouth, which he didn’t have before. I was thrilled to see my Cleveland Bay model in its new 2010 issue, as the grey Irish Draught model. 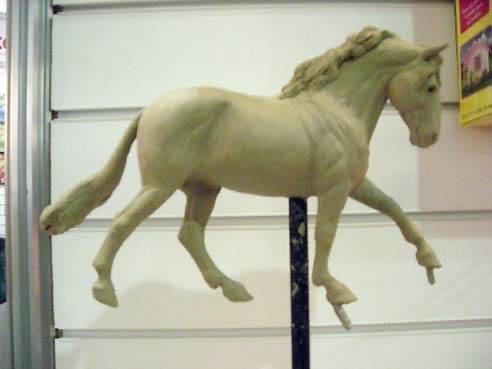 It looked fantastic in the dappled grey color, plus this one is sporting the alternate loose mane and forelock I sculpted for it. The folks at Treasure Trove wouldn’t let me take this one home but they said they’d get me one later. I do have four of them waiting for me back in Boulder anyway. I left at about 5pm and did the trains in reverse. It was a pretty day in London (no rain!) and I was yearning to just walk around the city but at 5pm it is already dark and I’d rather not do that by myself. I did get a lunch break and walked about a mile up to Kensington High Street to, where else, the McDonald’s! Paul met my train back in Maidenhead at about 6pm, like so many other people who live in the area. I expect we’ll be going into London a lot in these next couple months, because doing all the indoor museums makes perfect sense this time of year! NextBack in Colorado by June!